Select payment and shipping options. If you wish to pay online, make the payment with Credit Card/Debit card, PayPal or Net banking. If you wish to pay offline, select other methods and confirm the order. After making the payment inform us about your payment on this page (Payment Information). Check the video below for order placement on our website. 2. How do I get quotation from robokits? Quotations can be generated online directly through our website in same way as you place order with us. Just select products you want to order and add them to your cart. Login in to your account or create a new account on our website to go forward. Once you have logged in click on checkout and select correct shipping and billing address. Select "Generate Quotation" as the payment method and go ahead to step 3 and click "Confirm the order" button. You will be given a order number and robokits will send formal quotation to your email id in PDF format. 3. Once I make payment in how many days will I receive my order? We use best courier service Bluedart to deliver most of our parcels. In case your area is not served by bluedart we choose DTDC/Speed post for delivery. You should receive the products within 1-3 working days normally after we ship the products. It may even take 6-7 days if you are located at remote location. To estimate time of shipping please check http://www.bluedart.com/transittime.html . Origin city should be Ahmedabad. Make sure your pin code is served or not by bluedart from http://www.bluedart.com/locationfinder_domestic.html. In most major cities the order is delivered on next working day. For other location it may take few more days depending upon your location. The time quoted by Robokits is best possible time. It will completely depend upon the courier service to deliver the parcels on time. In case of any delays due to third party carrier ROBOKITS will not be responsible. 4. How to get products from our office in Gandhinagar? We do not have a retail strorefront at ahmedabad office. It is only a development, production and stocking facility open from 9:00AM to 5:00PM. All the products listed on our website are stocked at our Gandhinagar office and will be available ready in stock, however some products which requires assembly like drones and robots are not kept ready and are assembled on order. We prefer customers to order items from our website and confirm whether the order is ready for pickup or not and then visit our office for pickup. In case the order is not generated through our website customers may need to wait for longer period of time at our office as we give preference to already generated orders. 5. How to check total amount I need to pay for items I want to order? 6. Can I place orders by phone or email? If the order is not generated we can not provide warranty and future support to customers without any reference or Order number on our website. 7. I do not have credit card, can I still buy products from you? 8. Do you have any dealers from where we can buy products? No, We do not have any dealers. All the information of all our products are on our website. You can directly buy from our website and we will send the products through courier directly to your address. If you want you can pickup your parcel from our Gandhinagar office only after placing order through our website. Please confirm whether the order is ready or not before visiting us to avoid waiting at our office. Timings for pickup from our office is between 10 PM to 6 PM on all working days. 9. I want to buy a product from you which is not listed on your website. How can I buy that product along with my order for other items? For all the items which are available on the website, please generate an order. Send us an email on support@robokits.co.in with your order id for any further requests. 10. What are the discount options? We always try to sell the products at minimum possible price for retail customers however if you have higher quantities we can provide you suitable discounts. Further discounts are only possible if your order is above Rs.15,000. Just create order on our website and contact us at support@robokits.co.in for further price reduction. 11. We are conducting a workshop, Can you provide kits for us? Yes, We are already providing kits to many individuals and organizations at very competitive prices. For more information contact us with complete details at sales@robokits.co.in . Contact us before at least 2-3 weeks before the date of your workshop so that there are no hassles in the deal. We can also conduct workshops for basic to advance robotics and microcontrollers. Please contact us at sales@robokits.co.in for more details. 12. Can I get products on COD/VPP basis? No, We do not support this mode of payment currently. 13. Does Robokits give warranty on products? 14. What is covered under warranty? Warranty is provided to ensure that Robokits provides quality products and continue to improve products against general problems. However due to the kind of products we sell, its very easy to blow up the product due to many reasons like improper signals or power supply etc. We provide conditional warranty only in case there is genuine fault in the product. Warranty is provided mainly against non proper components/parts used in some products such that the product does not work properly or non proper assembling or manufacturing defects. Also warranty is provided for damage occurred during shipping. In this case warranty is provided on all of our products and customers must contact Robokits within 7 days after receiving the parcel or else the warranty will be void. Robokits is not responsible for improper installation or carelessness of users while handling the products. 15. How do I claim warranty on my product? Many a times customers do not check the product properly and claim warranty on the fully working product. We recommend you to go through all documentation provided by Robokits for the product. In case even the problem still persists please send write-up of testing procedure that you have applied and the results to our email id support@robokits.co.in. Please check our reply with all guidelines. Most probably the problem must be solved. In case there is no problems or warranty terms are void Robokits can ask customer to pay shipping charges for returning the product. Before returning the product customers should mark the product so that it can be identified. Also send Invoice copy and a small writeup via mail or a hardcopy in the package about the problem. Products returned under warranty are tested only once in a week on wednesday mornings by product developers at robokits to check the nature of the problems and to avoid such problems in future. If your product reaches to us on Wednesday afternoon the product will be checked on next Wednesday. The products should be returned to "Robokits India, B1+B2+B3/5 GIDC Electronics Estate, Sector 25, Gandhinagar, Gujarat, India." All communications related to warranty must be sent to our email id support@robokits.co.in. We cannot handle such queries on phone. Please quote your order number in all communications. 16. Will Robokits suggest products for my application? We can suggest products for your application. Please send us a mail on support@robokits.co.in for the same. Phone support may not be provided for the same. 17. I have ordered a product which is Not of any use or not required to me. Will Robokits replace or refund payment if I return the product? We do not accept returns of products in any case if they are as per the specs provided by Robokits. Since we provide technology products customers should choose items depending upon their knowledge and understanding about that product. We can try to help as we can for providing basic information but Robokits is not liable if the customer cannot use that product with any external circuits/mechanism/application. We accept Credit/Debit card and Net Banking payments through a third party payment gateway Payu which is secured and fastest way to make payments on our website. All your personal data for payments is taken only by Payu and not by us. We accept Indian & International credit cards like Visa, Mastercard, American Express, Citibank E-Cards, Diners Club International, JCB Cards. Please do not go to Payu page and wait too long to fill up your details or the session will expire and your order will not be processed properly. If you have selected any offline method of payment and afterwards you want to pay with credit card, please send an email to us at support@robokits.co.in with subject "Credit Card Payment : Order ID". Send an email on support@robokits.co.in or SMS on +91-7878967626 with amount and order number. You can pay easily by depositing Cheque/Demand Draft to our bank account. Please note that the order will be processed after the amount is credited in our account in case of Cheque and DD. Please note that cash deposits in any of our account are not accepted. Once you make the payment inform us by filling payment information on this page (Payment Information). We do not recommend this method as it takes a long time to reach us and it would also cost you for courier. Instead of sending the Cheque or DD to us you can directly deposit it in our bank account in your nearest branch of Bank of India or State Bank of India. You can send Multicity Cheque, Demand Draft or money order on our address as below. Orders will be dispatched immediately after receiving payment. In case of multicity Cheques orders will be sent after the successful clearance of Cheque. Cheque or DD should be drawn in name of "Robokits India" payable at Ahmedabad. 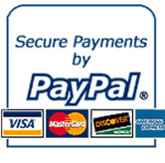 While checkout select PayPal as payment option to pay online with your credit card. You can checkout even if you don't have a PayPal account, you don't even need to register for PayPal. If you own a PayPal account, you can pay from same. We accept Wire Transfer, we use SWIFT code only. Please make sure that your bank can transfer via SWIFT before you select this payment method. Ask your bank to transfer funds via SWIFT.